Flatfeet is when the arch on the inside of the feet is flattened, allowing the entire sole of your foot to touch the floor when you stand up. This is a common and a painless condition. Flatfeet may occur when the arches of the feet don't develop during childhood. It may develop after an injury or from the simple wear and tear stresses of age. This condition can sometimes contribute to problems in the ankles and knees because it can alter optimal alignment of your legs. As long as you're not experiencing any pain, no treatment is necessary for flatfeet. 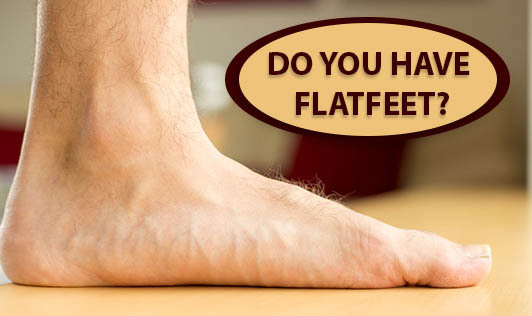 Most individuals have no signs or symptoms associated with flatfeet. Whereas, some people with flatfeet experience foot pain, particularly in the heel or arch area. This may cause swelling along the inside of the ankle. A flatfoot is quite normal in infants and toddlers because the foot arch hasn't yet developed. People's arches develop throughout childhood and some never develop arches. This is a normal variation in the foot type and people without arches may or may not have problems. Arches may also fall overtime due to years of wear and tear, and can probably weaken the tendon that runs along the inside of the ankle that supports the arch. Surgery may be performed only for an associated problem such as a rupture or a tendon tear.